Common in conifer forests at moderate and high elevations in Kittitas and eastern King Counties. Fairly common at mid-elevation sites in Kitsap County, uncommon at low elevations there and in Island County. Prefers older forest stands dominated by Douglas-fir. East of Cascade crest, found in all forest zones up to subalpine, but more common above ponderosa pine belt. 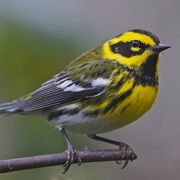 Except for forested north tip of Whidbey Island, lowland Puget Trough records almost certainly represent non-breeders. 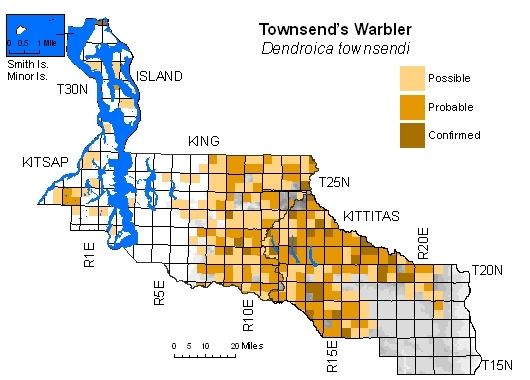 Regularly interbreeds with Hermit Warbler in southwestern Kitsap County, where many hybrids recorded.